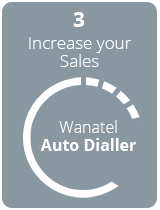 Wanatel Call Centre Metrics is a powerful monitoring and reporting software for inbound and outbound call centres. It provides extensive statistical and real time monitoring and metrics of your agents activity to ensure that your business objectives are met. With 150 metrics for calls, traffic and sessions, the management and monitoring of your call centre becomes as simple or as detailed as you want it. Your call centre operates in a stressful environment where you need to manage thousands of calls each hour while maintaining a high standard of customer services. To do this effectively, you need to keep an eye on the latest metrics and KPIs such as current service level, call volume and call resolution rates. 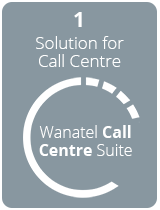 Wanatel Call Centre Metrics provide insight into the performance of your call centre by monitoring multiple key metrics. Understanding the number of agents currently logged in can help you anticipate issues that may arise from higher than expected call volume. In response to this, a manager may divert calls to a different service centre or call in additional personnel. Agents spending too much time on the phone may impact how long calls wait to be resolved which, in turn, can negatively impact your customer satisfaction levels. By being made aware of the impact of this behaviour, agents can be coached to reduce time spent on calls during busy periods. It is important to monitor service level in real time, as it provides an active barometer of your call centre’s current performance. If service level are fluctuating, you need to know immediately in order to solve the problem. Service level may be influenced by a range of issues, such as unexpectedly high call volume, unplanned service outages, or high agent absenteeism. 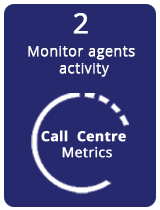 This Call Centre KPI measures the outcome of each call handled by your agents to monitor how well customer issues are being resolved. The objective of your service centre is to quickly resolve calls to meet service level agreements and deliver a high quality of service. Issues that are resolved on the first contact provide an indicator of customer satisfaction and call centre efficiency. Agent schedule adherence measures how effectively call centre agents manage their scheduled time for work activities. The metrics used in this KPI will include # of calls handled, average time on call, and average seconds to answer (ASA). A high adherence rate indicates that agents are being cost-effective with their time and providing responsive service to your customers.